Contaminants such as soap on the surface of the floor can cause bubbles. Other causes are overworking the finish with the applicator or not allowing bubbles from mixing to escape before applying the finish. 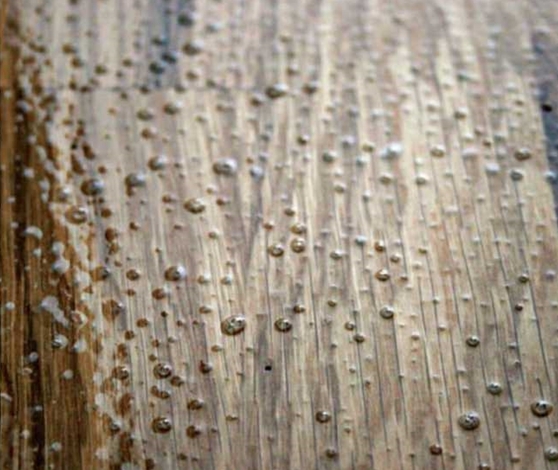 Applying a hot finish to a cold floor causes a condition where the top of the finish skins over quickly, trapping expanding air from the wood pores that creates bubbles. Excessive air movement can have a similar effect. Bubbles are hollow and can be distinguished from bumps (see photo at right) by slicing them through the middle with a razor. Remove a few bubbles with a sharp scraper and touch fresh finish into the holes. More numerous bubbles call for screening and recoating. If surface contamination was the cause, screening may not be enough and the bubbles will reoccur in the recoat. In that case, sand the floor down to fresh wood before recoating again.